If you are looking to apply for Canada PR in 2017, you must be asking this question to yourself, which is the best Canada immigration program to get Canada PR in 2017. Canada is the most desired immigration destinations across the globe. Every year tens of thousands of people apply for Canadian Permanent residency and other visa categories in Canada. Hence, Canadian government has designed several federal and provincial immigration programs to allow immigrants to come to and get PR in Canada. Among all the immigration programs, Federal Express Entry System is the most popular and applied Canadian immigration program. Express Entry is the federal immigration system of Canada that allocates Permanent Residency to the selected candidates. The Immigration Refugees and Citizenship Canada (IRCC) launched it in January 2015. Today, it is one of the most popular immigration programs of Canada. 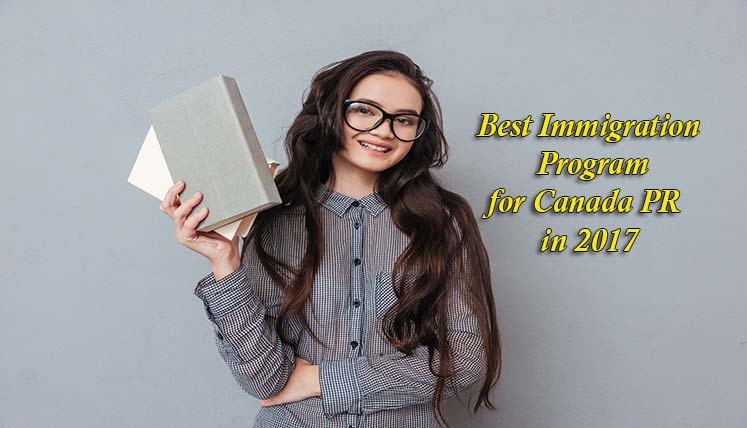 However, Canada don’t only have express entry system as an immigration program, rather, it has several Provincial Nominee Programs and Quebec Skilled Worker Program as well that provide pathway to permanent residency in Canada to the interested applicants. Several provinces and territories form Canada as a country. Moreover, most of the provinces in Canada have their own Provincial Nominee Program (PNP), through which they select suitable immigrant workers from overseas to nominate them for Canadian PR. These PNPs open their application intakes throughout the year, to accept a set number of applications from the total quota of nominations allocated to them by federal government. A person intended to move to a particular province can apply in its PNP as per the program guidelines and instructions. The Quebec Skilled Worker Program (QSWP) is another popular Canada immigration program that belongs to Quebec Province in Canada. Quebec is the bilingual province where the number of French and English speakers is almost equal. Both English & French are the official languages of Quebec. Needless to mention that the candidates, who know both English and French get preference in QSWP, as they have a better chance of succeeding in this major Canadian province. Which is the best Canada Immigration Program in 2017 to get Canada PR? Looking at the incredible results of Express Entry draws this year, it seems the best pathway to apply for Canada PR at now. Express Entry is the point based online system, which is based on CRS (Comprehensive Ranking System). The CRS assess the candidates based on their age, education, language skills, work experience, etc. criteria and accordingly allocate points to them called CRS points. The Immigration Refugees and Citizenship Canada (IRCC), launches an express entry draw every fortnight announcing the cutoff score for candidates. The applicants achieving the required CRS score get the Invitation to Apply for PR Visa from IRCC. This year, IRCC reduced the qualifying marks to its lowest during its many draws. As a result, most of the Express Entry draws in 2017 invited over 3500 candidates for Canada PR. However, despite the low qualifying marks in express entry draws, we cannot rule out the PNPs as the key pathway for Canadian PR, as several candidates still get selected via PNPs, who usually do not get ITA from IRCC due to their low CRS score. If you want to confirm your eligibility or process for federal Express Entry System or any other immigration program of Canada, you may send your details to info@visasavenue.com.